William Stephen worked as a baker with the firm of James (“Jimmy”) Davie, and by 1873, when William was 23 years old, quite a lot was happening to Great Britain in general and the Bakery Trade in Dunfermline in particular. 1873 – that was the year that was! The weather was the worst recorded, with tremendous gales and deep snow, followed by widespread flooding and an earthquake, then thick fog which caused thousands of deaths. They had pop idols even in those days, notably 31-year-old George Leybourne, who was earning £500 a week in the music halls singing “Champagne Charlie”. Well-known sporting names made their first appearance, such as Rangers Football Club, and in Dewar’s Hotel in Glasgow, at 8 p.m. on Thursday 13th March, 1873, eight football clubs met and agreed to form the “SCOTTISH FOOTBALL ASSOCIATION”, only the second such body in the world! The Scottish Rugby Union also made its appearance in 1873 – and somewhat confusingly, a horse called “Doncaster” won the Derby! Many present-day national household names such as “Poole Pottery”, and “Benson and Hedges” commenced in business. All sorts of other things happened; Napoleon III died, with 40,000 people at his funeral; Gladstone was a popular Prime Minister, the Bank Rate went up and down like a yo-yo; and America invented the moving pavement! There were only 23 million people in the Great Britain of these Victorian Days. Locally, some of the bakery firms were David Christie, Allan Keir, James Faults, M. Carmichael, Andrew McRobbie, Jimmy Davie, Sanders the Baker (later Alex Robertson’s), Mrs Shaw and Robert Purvis. A family were reported in the “Press” as having been poisoned by eating a cake made from arsenic instead of soda, but fortunately that happened outside the City boundaries! An advertisement for a baker in April 1873 read, “Wanted, a good journeyman Baker – Sobriety Indispensable!”. The new National Bank Office in Guildhall Street – “built in a very chaste Italian design” – was erected, and Fraser and Carmichael were offering Scotch Whisky at 2s 1d a bottle and Sherry at 1s 4d a bottle! A Mr James Terris was presented by his work-people with an “elegant marble time-piece” after retiring from 30 years as manager of Kelty Coalworks, and in the same month (June) there were 126 depositors in the Penny Bank, the amount deposited being £15 11s 7d, but £8 1s 3d was withdrawn. “W.S.” was of course, Union Secretary, William Stephen, and on Saturday, 3rd May 1873, he called on the associated Journeyman Bakers of Dunfermline for a full attendance at a meeting in Pilmuir Street hall, at 7 pm. The duration of the strike is not certain, but by Saturday, 10th May, the bakers’ dispute was reported as being “virtually at an end for the present, most of the men having accepted an advance of 2s per week” – they had asked for 4s ! William however, was not allowed to re-start work with Davie’s, having been sacked by the foreman, “Tam” Stenhouse, for being one of the strike leaders! It is interesting to note the spelling of his name with a “v” – his father was from Caithness, where such a spelling is used, and William’s birth certificate shows the name “Steven”, but when the family moved South, they adopted the Lowland spelling of STEPHEN. Gibb Street is, of course, now called St Margaret Street, and the original bakery was just a little south of the present bakery complex, where the Glen Gates now are, and in what was then an old house and bakery set in garden virtually opposite the little Moodie Street house, where Andrew Carnegie was born. In the shadow of the Abbey and Palace, right on the route where the King’s Couriers and the Abbot’s messengers from Rome would all have passed from Queensferry to the Palace Yard, William Stephen started off on his own. 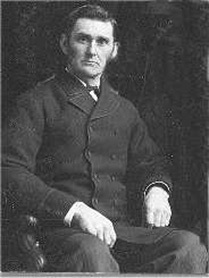 He worked hard and began to prosper; apart from his baking work, it is known that he was elder of Gillespie church and did many charitable works in the City. He married in 1874, the year after commencing business, and there were four sons and two daughters. By 1878, William had built his new bakery at 15 Gibb Street, our present office being the shop and his house above. The present sundries store was the bakery entrance door, and he could pull a rope at his bedside to open the door when the early-shift bakers knocked on it – a sort of combination of remote-control and time clock! In 1891, he built the present corner shop at St Margaret Street and the two-storey block of houses – the new shop was built in its quaint curved shape because he gave a bit of his ground to the Town for nothing (!) for road-widening and improvement. Since those days, the Town has taken AWAY a few of our older square-cornered shops, to widen and improve roads, so again we have an example of William’s far sightedness! The gorgeous three-storey block of houses in Monastery Street he built in 1892, and the whole complex of buildings is now considered to be a feature of the City as an example of late 19th century domestic architecture. Always ahead of his time, William installed in his own new house in the block, the first “shower bath” in the area, and in 1903 he installed in the bakery our most unusual Double Scotch Oven. It is a measure of the man that one of the men he took on as a baker was none other than the Tam Stenhouse who had sacked him years before and who had fallen on hard times, and he retained and even fed poor Tam till his end. Another “Tam” with past and present day connections is one Tam Cameron, a delightful man who lived above the office in a flat which is now the Boardroom. He was a very skilled engineer, and was of enormous help around the bakery, forever working on machinery or tidying up as his “hobby”. We depended on him emptying the 3 scotch ovens full of meringue shells every evening, having loaded them just before the day shift finished. After Tam died, his spirit would not suffer any other person living in “his” house, every time we tenanted the house with a member of staff he would manifest himself in various guises and scare them out of the premises. Tam’s spirit is now at rest since we stopped using the flat as a house! There is also our other and much older ghost who confines himself to the Bakery itself, he is called “Old Cook” and was a Mr Cook, flour delivery man, who fell down the loft stairs with a 280 lbs sack of flour on his back and was killed. He opens doors and windows and makes heavy footsteps throughout the bakery, especially when one is in the place alone late at night! Many of these TRUE and AUTHENTICATED stories survive but – back to business! May 1927, saw the business of William Stephen, Bakers, sold to Mr Charles Bowman, who already owned a licensed grocery in Chalmers Street, and in 1928, William Stephen died at the age of 78. A young baker, Alexander Terris, who had served his time with Townhill Co-operative Society, was at this time working with Messrs J. D. Bruce, and he came to Stephen’s as a Confectioner in 1933. Business was in a considerable decline in the early 1930s, and Charlie Bowman’s business of William Stephen Bakers, was at a particularly low ebb; he made Alex Terris foreman in 1935 with the instruction “make a go of it or I sell out”, but Mr Bowman eventually did sell out – to Alex! Alexander Terris – known in most circles as “Sandy” – was the son of a Townhill colliery joiner, and was a man of many talents and extraordinary energy and acumen. In his youth, he was no mean athlete, being a Powderhall sprinter, an amateur boxer and coach, and a devotee of football and swimming. In addition to working long hours as a baker, he also founded, edited and published a local newspaper called “The Review” which commenced in 1924, and unfortunately proved a financial disaster. He also did professional photography, and was extremely active in the political field, albeit changing Party from time to time. In 1942, in the thick of the Second World War, Mr Terris purchased the business of William Stephen, Bakers, from Mr Bowman and started business on his own account in a period of great shortage of both labour and materials. The business at that time consisted of the present Bakery and shop at St Margaret Street, and two rented shops at High Street and Chalmers Street plus a horse-van and a motor van. During the war years the business was developed as much as was possible with the many restrictions, and a very considerable wholesale and catering trade was developed. Sandy Terris became a well-known figure in the town, and was a prominent member of many of the local organisations. A man of great generosity, many were the causes which he supported both financially and physically with considerable self-denial. His great interests in life, apart from business and family matters, were football and sailing, and his period as a Director of Dunfermline Athletic will be remembered by many as being “revolutionary”. After seven hard years of effort by he and his wife, Margaret, in the establishing of a viable bakery business, and just at the time when restrictions were beginning to ease, Sandy’s tempestuous life came to an abrupt end in a car accident on 22nd October 1949. 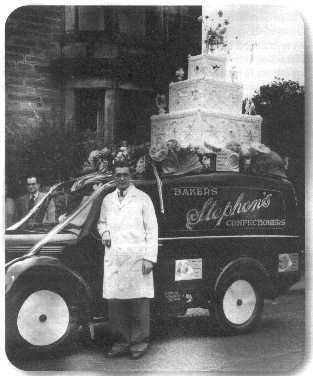 The later years of the decade saw considerable modernisation of the bakery establishment, and the growth of production and sales through a large fleet of vans. In the mid-fifties, larger shop premises in Chalmers Street were opened, and in 1957, a branch shop was built in the new housing area at Duncan Crescent. The firm became a Limited Company in 1958, the Directors being Mrs Margaret Terris, Mr Ian M Terris and Mr Alex D. Terris, and in 1959, the Retail Shop and Coffee Lounge in Guildhall Street was opened. 1963 saw the acquisition of the bakery and shop premises of Messrs R Wood in Rosyth, and in 1965, the shop in Pilmuir Street was opened. In 1967, the first shop in Inverkeithing was established in the High Street, followed by the shop in Fraser Avenue in 1968. In the Spring of 1974 we purchased the “Glen Café” in Chalmers Street and refitted it as a Bakery Shop & Café, our previous shop at the corner of Chalmers St. and Pittencrieff St. being under a demolition order for yet another road widening ! 1976 saw Stephen’s very involved with its membership of the Scottish Bakery Training Group and much groundwork was undertaken to create a firm foundation for the Staff Training which has become a benchmark feature of this company On the last day of the year 1977 our long-serving Bakery Foreman, Colin Fowler retired, aged 65, having been a master craftsman with Stephen’s since 1938. In April 1978, all Stephen’s Shop Manageresses were given their first of many subsequent exposures to ” K & S International Consultants “, this debut was titled “The Art of Selling”, in the Green Hotel, Kinross, we didn’t imagine THEN that in years to come Stephen’s would have “K & S ” as principal trainers for many years. Also in 1978, Ian & Jean Terris’s middle daughter, Lesley, commenced studies at Queen Margaret College, reading Institutional & Business Management and Commercial Catering, with no inkling THEN that she was destined to become Stephen’s Joint Managing Director a decade later! Our year’s staff wages topped quarter of a million pounds for the first time . Our flagship Guildhall St. shop was fully refurbished in 1981 to what was, for those days, a true “state of the art” retail bakery and café unit. By 1982, Stephen’s turnover had reached the magic “Million Pounds” target. Lesley, who had worked since her early teens on Saturdays and during school holidays in various Stephens shops, spent her 1981 summer holidays from Queen Margaret College as our Shops Supervisor, initially coordinating and consolidating operations at Guildhall Street Shop and then round all our Branch Shops, until her return for final examinations and award of a Higher National Diploma. After a years sabbatical in Canada, Lesley returned to Scotland to gain further Retail Bakery experience with Messrs. Goodfellow & Steven of Broughty Ferry, and after a further full-time course with K & S International Consultants, she was appointed to the post of Shop and Sales Management Supervisor in November 1982. In August 1983, a very good Bakery Trade friend, Bruno Sarafilovic, who had founded the well-known “Pars Bakery” chain of retail bakery shops in the Glasgow area, came through to Stephen’s with his son André for a look-around and to make arrangements for his son to do a few weeks bakery training in Dunfermline. Although again it could not possibly have been foreseen at the time, this arrangement was to have very far-reaching effects on the future helming of Stephen’s! Youngest daughter of IMT, Rona, having completed Business Studies at Napier College and a sabbatical in Switzerland, was managing various of Stephen’s shops on a rotation basis, and fell in love with our Bakery Management Trainee from Glasgow ! By 1986, Stephens’ sales were over 1¼ million, and our close business and family association with Pars Bakery saw us borrowing their mobile “Trailer Shop” to trade from Inverkeithing High Street’s kerbside whilst our shop was being totally refitted. Lesley was appointed to the Board of Directors of William Stephen (Bakers) Ltd on 17th April 1986. Rona and André were married on 27th September 1986, and Rona became a part-time Shop & Sales Supervisor for a couple of years. We were computerised fully in 1987, and our progress in all aspects of Training led to Stephens being awarded Approved Training Organisation status, and Lesley was presented with the prestigious Young Business Personality of the Year Award by Sir Eric Yarrow, Chairman of Clydesdale Bank, and Lord Gould, Chairman of Judges. Towards the end of the year, our Directors had in-depth discussions with our Consultants to explore how best Stephen’s future could be assured, in view of Mr Alex Terris’s health problems and Mr Ian Terris’s stated intention of retiring from business sometime in 1990. A number of possible mergers with some well-known successful family bakery companies were investigated, and negotiations were advancing rapidly , when Mr. Bruno Sarafilovic came to see Ian Terris on Wed. 13th. January 1988 and indicated that he would be extremely upset if Stephens looked further than the young generation Management of Pars Bakery to continue the traditions of this old-established family bakery business, especially in view of existing business and family connections ! Thus the seeds were sown, and on Friday February 26th 1988 mutual agreement was arrived at for the eventual merging of Stephens and Pars Holdings; the following day, Sat. 27th. Feb., Natalie Jane, André and Rona’s first child, was born ! Big changes continued throughout 1988 : The 1st. June was the effective date for control of Stephen’s to pass, Alex. Terris and Mrs. Margaret Terris retired as Directors, and the Joint Managing Directors became André Sarafilovic and Lesley F. Terris. On Tuesday 26th. July, ex-Chairman of the Board, Mrs. M. Terris, died, the end of another era.. At a function on Saturday 6th. August, attended by the entire Stephen’s staff, Alex Terris was presented with many Commemorative gifts to mark his life-long service to Stephens the Bakers. The 22nd. October 1989 marked Ian Terris’ 40 Years of Service with Stephens. 1990 saw Ian in the thick of Centenary Year preparations for the SAMB’s big events in 1991, in his capacity as Convenor, and also involved in many “Business Plan” meetings to ease and progress the leadership transition at Stephens. Lesley went to Hyde Park Hotel in London for her “Women of Tomorrow” award. Gordon Cheyne marked HIS 40 years of service to Stephens on 1st. February, and on Sunday 25th. March, (Mothers’ Day), we had a big Staff Function at Queensferry Lodge, to celebrate IMT’s 60th. Birthday and to formalise his gradual “loosening of the reins” and Lesley & André’s assumption of Joint Managing Directorship of Stephens. The late 1980’s and early 1990’s witnessed a radical change in Retail Bakery Shops, with increasing emphasis on lunchtime trade involving the introduction of Sandwich Bars and Bake-Off Ovens. Employment Legislation and Food Regulations changed rapidly, with the introduction of such undertakings as HACCP’S and Risk Analysis. In 1991, a new branch shop was opened in Cowdenbeath High Street, and in 1992 Stephen’s returned to a presence in Dunfermline’s High Street with a new Branch Shop on the busiest part of the shopping spine. 1991 was also the Centenary Year of the Scottish Association of Master Bakers, and Stephens staff played a very prominent part in the many splendid and ambitious celebratory events during the year, contributing particularly to the running of the magnificent Working Bakery which was the centrepiece of the Royal Highland Show in Edinburgh that year. May 12th., 1993, was Stephens 120th. Birthday. A major addition to the Retail Outlets was the progressive opening of Bakery Units in Shoprite (now Kwiksave) Supermarkets, in Dunfermline, Kirkcaldy, Methil, and Cowdenbeath. Ian M. Terris was presented with the “Special Award”, the Golden Wheatsheaf for Lifetime Achievement and Service to the Bakery Industry, at Grosvenor House in London, by T.V. newscaster personality Martyn Lewis. June 1994 saw Lesley married to Alan Marr, Managing Director of the long-established and very prominent family bakery business of Thos, Auld & Sons Ltd. of Greenock. Also this year, one of Stephen’s young craftsmen became one of the first to achieve the Scottish Vocational Qualification in Craft Baking Level 2, another example of our dedication to Training. Colemans, owners of “Kwik Save” supermarkets, named Stephen’s as “Best Bakery Concessionaire” in their 1996 National Competition, and England’s Rugby hero, Will Carling presented the “In Pursuit of Excellence” Award at a function in Manchester. Stephen’s again led the way in Staff Training by participation in a pilot programme for Retail SVQ Level 2. In 1997 we opened our first concession bakery department within a David Sands Supermarket, and as we celebrate our 131st Anniversary, Stephen’s now operate in all of 19 David Sands’ Supermarkets..
Inevitably, there are many omissions from this short history, which only attempts to record most of the key moments of Stephen’s progress since 1873. The 19th. Century, in which Stephens Founder, Stephens itself, and Stephens original staff were all born and lived, was a period of PEACE AND PROGRESS which carried Great Britain to the LEADERSHIP of the WORLD. This “almost-100-years” of the 20th Century, in contrast, has been a period of STRIFE…..Stephens has seen the Boer War, the First World War, the Second World War, The Korean, Vietnam, Falklands, and Gulf Wars, plus Civil Wars in many parts of the World. But Stephens has also developed and grown and progressed throughout a period of enormous technical revolution ; we have seen the birth of transportation by petrol-powered motor vehicles and by “flying machines”, the development of communications by telephone , radio, television and computer. Stephens has been baking continuously during the reigns of 6 Monarchs….Queen Victoria, ; Edward V11 ; George V ; Edward V111 ; George V1 ; and Elizabeth : We could claim to have “Baked from Queen to Queen “, as we started baking in the reign of the present Queen’s Great-Great- Grandmother ! Stephen’s is still very much a family business, and is essentially a local family craft bakery using traditional methods and craftsman’s skills and offering interested, personal service to customers. The present Directors of William Stephen (Bakers) Ltd., are greatly indebted to many employees, past and present, who have served the Company so faithfully over these many years, and are grateful to the Public of West Fife for their custom and support in making “Stephen the Bakers” a household name in the area. 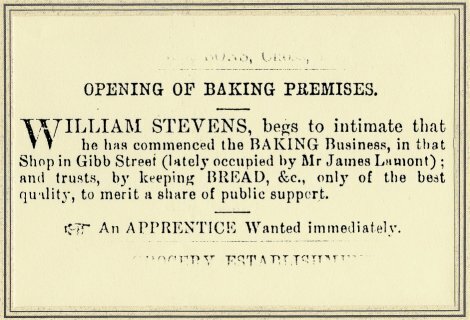 One cannot know if William Stephen foresaw the Bakery Business he started in 1873 still flourishing and bearing his name one and a quarter centuries later. It is, looking back over 144 years of tremendous change in the world, of some comfort to experience this notable anniversary of a family firm still actively engaged in the type of trade and principles on which it was founded. What the NEXT 144 years holds in store for us and our children and our childrens’ children, cannot be predicted, but as Stephens the Bakers enters the Third Century of its existence, perhaps 56 years from now, in the year 2073, the carefully preserved records of this fine old craft business will be opened, wondered at, and commemorated by persons not yet born. Meanwhile, let us not think of Stephens as being an old company, but 144 years young !